For my part, it’s pretty hard for me to stomach most of the commercially available bars out there. Never mind that they are a convenient source of calories packaged nicely for consumption on the trail. They’re mostly … well… yucky. If I were going to design the perfect trail bar, it’d look, taste, and function pretty much like a Snickers Bar, but wouldn’t melt all over if it was hot out. Ta da. Enter the YouBar. 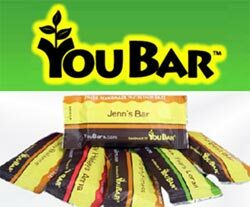 At YouBar.com, you build your own custom bar, choosing the ingredients to put in. They have plenty of delicious-sounding options – organic nut butters, dates, nuts, dried fruit, granola, chocolate chips, honey – everything a snicker-loving person could want. They also have a nifty nutrition label on the right side as you design your bar so that you can make sure that you have the right combination of protein, sugar, and vitamins – and you can immediately see the effect of adding chocolate chips to your bar, for example. There are blanks in the form for special requests, and if you’re willing to deal with a ‘delicately textured’ bar, you can even get 14g protein with only 5 g of sugars. Then, you can name your bar, conveniently labeled so that we wouldn’t confuse Theresa’s bars with Tom’s bars, and they ship it off to you – and they are guaranteed delicious. If you try some funky concoction that you absolutely can’t eat, they’ll take the left-overs back and send you some other option. The big downside is that at $3/ bar, they’re far more expensive than your typical off-the-shelf bar, and I’m struggling with myself to justify the cost. It looks like so much fun! Has anyone tried this? What do you think?